Ahhhh bolognese, the comforting dish that brings a smile to the face and helps when times get a little bit rough. Whether it’s a broken heart or a horrendous commute having this bolognese ready and waiting is sure to warm you up from the inside out. Fresh herbs and a base of juicy mushrooms are combined with crushed garlic, tomatoes and some all important vino to make up a vegan version of a true classic, Keep it traditional and serve up with messy, slurp-able spaghetti, topped with basil and vegan parmesan and bread oozing garlic deliciousness to go with. 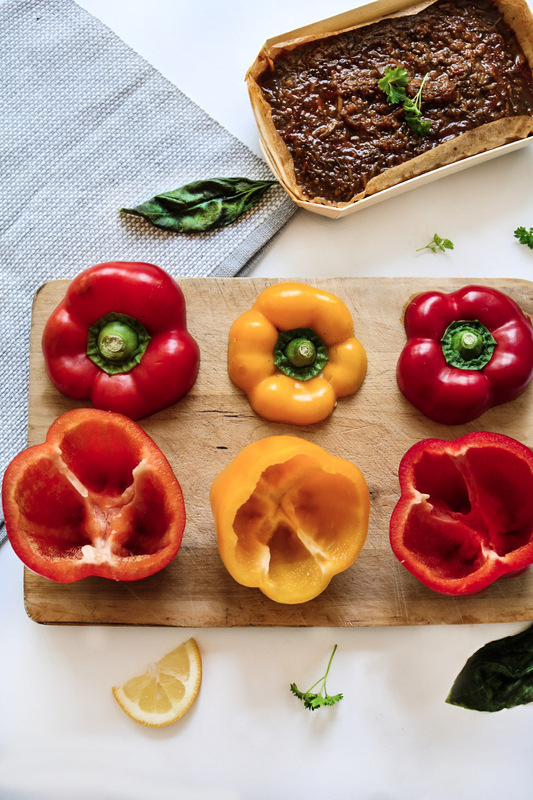 Alternatively, if you’re gluten free or simply looking for a lower carb but protein packed meal, why not use your bolognese to fill up some vibrant peppers. and roast in the oven? Here’s how…. 4 x medium peppers. Red and yellow are our faves as they go extra sweet when roasted! Cook both your quinoa or chosen grain and our bolognese according to packet instructions. Meanwhile, tackle the peppers by slicing off the tops and de-coreing their centre. Once the quinoa and bolognese are good to go. Mix them together in the pan you cooked the quinoa and stir through until evenly combined. Fill each pepper with the mixture, leaving a little bit of space at the top (to reduce spillages). Lightly grease a baking tray or dish and place each pepper and their top onto the tray (we re-used our poplar wood baking dishes for this - cos that’s how we roll). Place in the centre of the oven and allow to roast for 45 minutes for extra soft and gooey peppers or 35 minutes if you like them with a little more bite. When the peppers look how you want them. Remove from the oven and place to one side to cool. 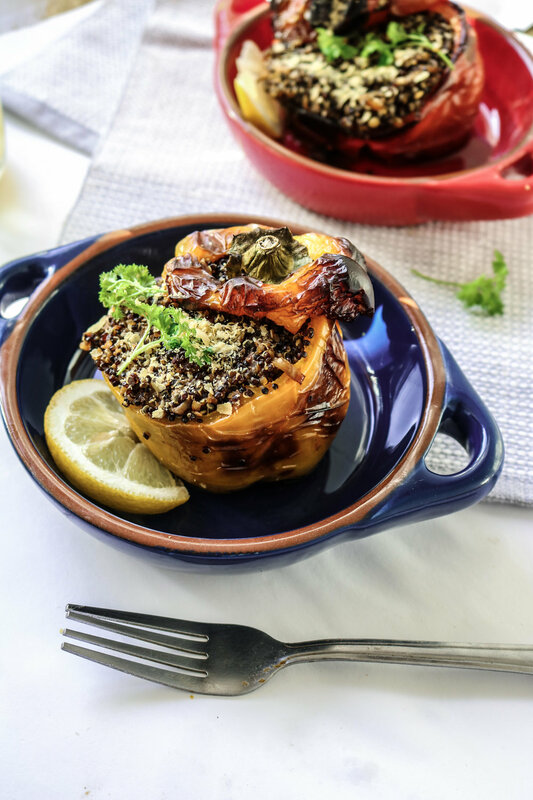 Once they’ve cooled off and are all good to handle, serve them up with a sprinkle of fresh parsley, basil a squeeze of lemon juice and an optional 2 tsp’s of nutritional yeast, vegan grated cheese or even some pine nuts for a little extra crunch.